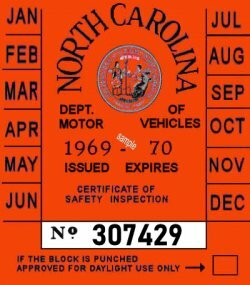 1969-70 North Carolina Inspection Sticker - $20.00 : Bob Hoyts Classic Inspection Stickers, Add a Final Touch to your Restoration! This 1969-70 North Carolina Inspection sticker has been carefully reproduced directly from an original, both front and back. This sticker is among the most attractive stickers in all the United States during the 1970's. It has a UV coating to proect it from fading.